(Office of Her Majesty, Press Department – Amman) Accompanying His Majesty King Abdullah II on a visit to the United States, last week, Queen Rania spent much of her time promoting cultural understanding, women’s empowerment, and advocating for her charity organization, the Jordan River Foundation (JRF). Queen Rania’s first program included a visit to Gallup’s Center for Muslim Studies, on March 3, to review the center’s latest findings and to discuss the Muslim-West Facts Initiative, a not for profit partnership between Gallup and the Coexist Foundation whose mission is to promote understanding between Eastern and Western communities by sharing the views of the people. Many of Queen Rania's programs have focused on appreciating the various perspectives in the world, finding common ground and bridging the cultural divide between East and West. Dalia Mogahed, Executive Director of the center, along with Ahmed Younis, a senior analyst at the center, explained the polling process and shared the highlights of their findings, many which fly in the face of conventional wisdom. The research, which first began in 2001, includes interviews with a representative sample of respondents from more than 35 nations, reflecting the views of 90 percent of the world's 1.3 billion Muslims. The results of the study- the largest of its kind- will be published this month as part of a book titled Who Speaks For Islam? What A Billion Muslims Really Think co-authored by John L. Esposito and Dalia Mogahed. The poll found that most Muslims wanted the West to focus on changing its negative view of Muslims and Islam, and that the vast majority want democracy, but do not want it to be imposed. Also on March 3, Queen Rania highlighted her foundation’s achievements to a gathering of influential women, where she discussed many of JRF’s specific initiatives and encouraged their involvement. At a luncheon hosted by JRF USA board members Beth Dozoretz and Pat Mitchell, Queen Rania spoke about her personal investments in the foundation. “I launched and have supported JRF for over 13 years now… because it’s all about giving a helping hand to the ordinary people of Jordan who want to work and provide for their families, who want to contribute to the development of their communities, and who want a chance to prove and improve themselves,” she said. Director of JRF Valentina Qussisiya campaigned for the foundation’s newly launched Sponsor a Child initiative that seeks to mobilize donors and philanthropists to sponsor the rehabilitation costs of severely abused children at Dar Al Aman (House of Safety). Dar Al Aman is the first shelter for abused children in the region and the only therapeutic center for child victims of abuse and mistreatment in Jordan. The children at Dar Al Aman range from infancy to early adolescence. To date, the foundation has reached almost 20,000 individuals through its rehabilitation and prevention activities. “[This is] a rewarding figure for sure, but our greatest reward is the sigh of relief and the sweet, unguarded smile of a child whose right to childhood has been restored at last. Making a difference in a child’s life is what makes it all worthwhile,” said the Queen. JRF has recently established several new online communication mediums to spread their mandate to a wide virtual audience and garner financial support. By setting up an interactive YouTube page, JRF hopes to reach out to a wide constituency. JRF has also set up several online financial and marketing tools, including Network for Good (http://www.networkforgood.org/) and Six Degrees (www.sixdegrees.org), where JRF is registered as a tax deductable 501 charity organization. In line with the Queen’s mandate to promote women’s empowerment issues, Her Majesty joined the United Nations Foundation and the Vital Voices networks to celebrate International Women's Day, which was celebrated on March 8 around the world, to stress the need for more investment in women’s advancement. Her Majesty focused her remarks on the progress women have made in advancing economic opportunity and building civil society and political progress. 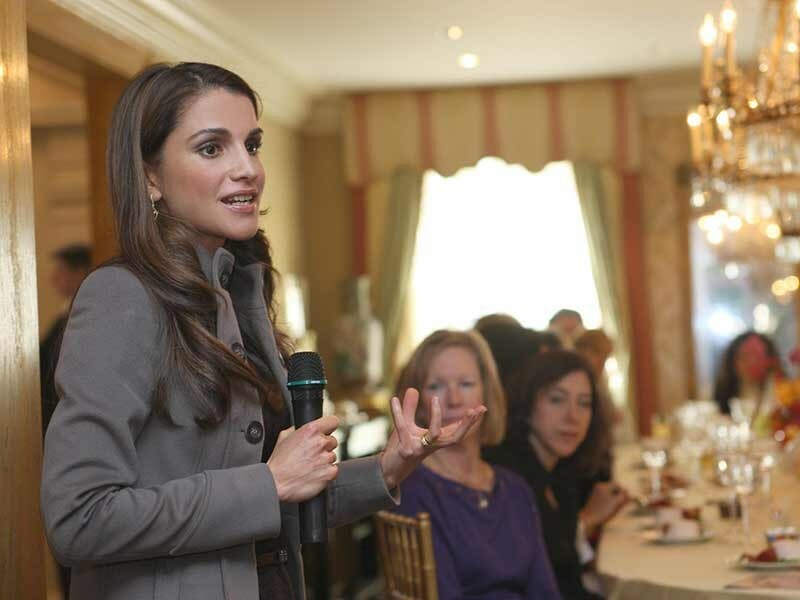 Queen Rania also noted that despite the strides women have made, many challenges remain. Citing her first hand field experiences, the Queen spoke passionately about the changes she has seen, especially in Jordan and in the region, when women have access to business opportunities and political participation. “We are moving in the right direction,” she said of the Arab world, “The number of Arab women entrepreneurs is on the rise… in my travels across the region, from Lebanon to Morocco to Dubai, I see Arab women taking on an ever greater role in society – as doctors, lawyers, and teachers.” She reminded her audience that investments in women benefit all sectors of society. “Working women are not only better able to support their families, they strengthen productivity and bolster growth for their communities and their countries,” said the Queen. The Women Can Campaign, launched this week to coincide with International Women’s Day, will help identify, inspire, train, and empower women leaders in developing countries and emerging democracies around the world, and to communicate the value of women’s leadership. The Queen praised the campaign's founder, Melanne Verveer, Chair of Vital Voices Global Partnership, and her partners: Exxon Mobil Corporation, designer and CEO Diane von Furstenberg, International Business Advisor Carly Fiorina, and Adversiting Firm EURO RSCG Worldwide for their leadership.